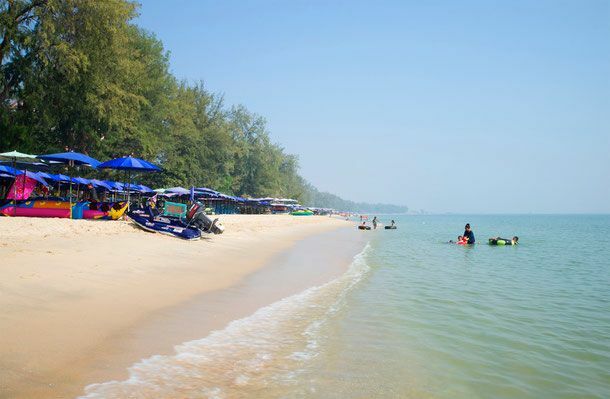 HomeHua HinHip Hua Hin: Spend Your Holidays Here at This Seaside Town! Hip Hua Hin: Spend Your Holidays Here at This Seaside Town! I'll be taking you guys to Hua Hin by my private car! You will enjoy eating recommended restaurants and street food. We can do some activities in Hua Hin such as riding a banana boat! All of these plans can change if you want to do other things! Pass through Porto Chino Community Mall in Samutsakhon! We can buy some drinks or snacks here for for the road trip! We arrive at Hua Hin! Let's go to the Palace of Love and Hope (Mrigadayavan Palace), where it was King Rama V's summer palace! Take a look at the beautiful architecture! Let's have lunch at Khrua Kannika Restaurant! I recommend this restaurant if you want to eat delicious Thai dishes! We can also go to XXL Kitchen if you want to eat Western dishes! Take some cool pictures at the Hua Hin Railway Station. Next, we visit Plearnwan Vintage Market. This market is a tribute to the 80's Thai lifestyle, where there are a host of shops selling many different products! Let's chillax on the beach, and enjoy some water activities like swimming or riding the banana boat! You'll surely have the time of your life! Let's go to a street market! (P.s., we can have dinner either at the street market or at any nearby restaurants, all your choice!). If we still have time, I can take you to another market which is called Cicada Market, a hugely popular place to hangout for the locals! Let's go back! I'll send you back at the BTS Udomsuk Station. Have a good night! Thanks for joining me! We can share some wonderful time at Hua Hin together. This trip will cover a lot of recommended popular destinations. If you need to swim, please prepare swimming suit, towel, or clothes for change. Explore the Wonderful Sights of Khon Kaen! Enjoy Udonthani and Nongkhai in a Day! and get a free insurance!